With the cold of winter and heat of summer, sometimes the ideal cigar is one that doesn’t last much more than 30 minutes. Because of this, I find I’m always in search of a good, reasonably priced little cigar. The challenge, however, seems to be taking a full-sized blend and miniaturizing it without losing complexity and nuance. It sounds simple enough, but experience suggests it isn’t, at least not while keeping the cigar affordable enough to peak consumers’ interest. Introduced at last summer’s trade show, the Travailleurs, along with mini (4.5 x 38) versions of the Surrogates (Animal Cracker), El Suelo, and Trocadéro, started shipping earlier this year. All the L’Atelier brand minis come in five soft-packs and have a recommended price of $14.50 per pack ($2.90 per cigar). No cutting of the cap is needed as it comes pre-cut. Once lit, I find medium-bodied smoke. There are doughy bread and hay flavors, hints of graham cracker, cream, and leather notes, and a persistent dry sawdust finish. There’s little variation beyond that profile, but the result is a consistent, tasty smoke for 30-40 minutes. The cigar is a little soft to the touch, but that isn’t to the detriment of construction. The burn is even and the draw isn’t too tight (a common problem for small cigars). While my quest for the perfect mini cigar may not be over, this new offering is a welcome addition. 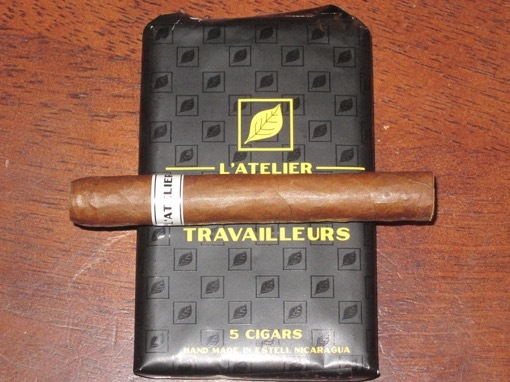 The L’Atelier Travailleurs is a straight-forward but tasty, well-constructed, medium-bodied little smoke offered at a very reasonable price, and that earns it a rating of three and a half stogies out of five. Been looking forward to trying this and the Animal Crackers mini smokes. Thanks for the review.